In some modern time precise device manufacturing work fields, the real line alignment work would be processed at quite long work distance. It is not realistic at all for users to only adopting simple line printing device. On contrary, on basis of constant work on mature 650nm red laser diode tech and external equipped thermal emitting system, high power 650nm red laser line generator is able to work with improving laser beam stability and maintain highly stable and highly accurate red reference line projection in distance efficiently. In long term continuous line aligning work, the use of high power 650nm red laser line generator is required to maintain excellent laser beam stability in constant use. It is making super great technical innovation of thermal emitting system. The use of separate metal heat sink cooling system is not only getting much better performance than air or water cooling, but also leaving enough space for laser module to obtain even better thermal emitting in constant use. The adoption of aircraft used aluminum alloy housing tube is getting super nice thermal conductivity, and then easily supporting red laser module with quite stable line alignment in various working environments. Owing to the adoption of import 650nm red laser diode within 150mW to 500mW, high power red laser line generator always gets improving laser beam stability and quite excellent laser light source generation from laser beam aperture. It is able to work with daily use within 8 to 10 hours. Although red laser module keeps constant line alignment work, however, in order to reduce possibility of laser diode and electric driving circuit board burning out or damage, it should be operated with certain time cooling down so as to maintain its good working condition in daily use. Under proper line aligning work by skilled users or professionals, it is always getting up to 80% laser beam stability and quite long serving lifetime in use. Whatever kind of working surface, including those of hard reaching places, high power red laser line generator is used freely. The extending electric wires are getting wide installation distance within 0.3 meter to 3 meters, and then achieving highly clear line positioning results on any vertical or horizontal surface efficiently. This high power alignment laser is a strictly tested device, which is just keeping highly stable performance, without any appearance of laser light decay or blur in long term use. Anytime highly intense and powerful red laser light and thermal energy are produced, users should always remember to wear 650nm wavelength preventing laser safety goggles, and make sure of secured and free line alignment constantly. If there is quite strict requirement of highly accurate dot alignment at quite long work distance, it is just becoming a trend for users to use advanced laser tech applied high power 650nm red laser diode module. It is employing high power 650nm red laser diode as its laser beam emitting source, owing to its beginning high power of 150mW to 500mW, it is workable with super intense and bright red laser beam emission with several miles far away. On basis of quite easy selection of output power and adjustment of laser beam focus, highly intense red laser light is concentrated, and then achieving super clear red reference dot targeting immediately. Owing to excellent use of high power 650nm red laser diode as its laser beam emitting source, this high power red laser is generating super clear red laser beam at several miles far away. It is available with high power range of 150mW to 500mW, unless its use under sunlight, it will easily get super clear dot generation under high lighting and long distance efficiently. 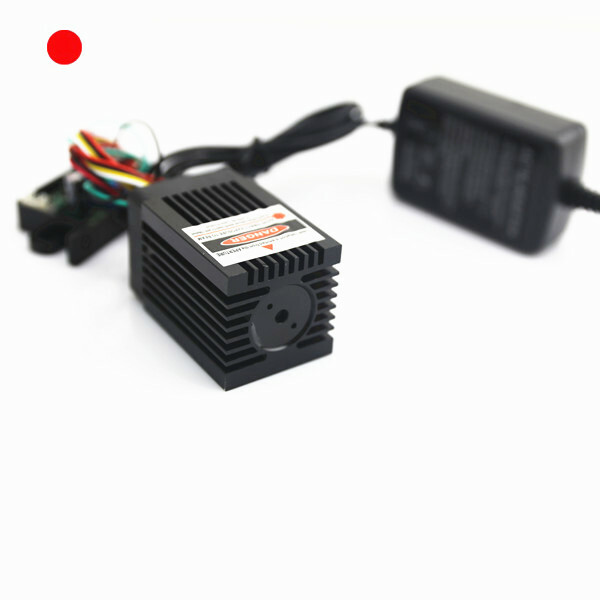 Anytime users are connect with red laser device with a DC input power supply, it will make super clear and rapid dot generation on any working surface. When high power 650nm red laser diode module is used for long term continuous dot alignment work, it should be workable with super strong environmental stabilization. The adoption of aircraft used aluminum alloy housing material and copper material made laser diode core part are assuring superior thermal conductivity, and improving possibility of laser beam stability in continuous work. However, if this dot laser alignment is workable for quite long time without break, it will increase possibility of laser diode and electric driving circuit burning out or damage. With daily operating time of 8 to 10 hours per day, it assures excellent laser light cycling use and highly stable red reference dot emission in continuous work. If some of working place is not easy to reach, the genuine use of high power 650nm red laser diode module can work with the assistance of a laser alignment mounting bracket. Red reference dot targeting direction is freely adjusted within three dimensions, and then achieving highly clear dot positioning result on any vertical or horizontal surface efficiently. Anytime users are wearing professional 650nm wavelength preventing laser safety goggles and avoiding eye exposure to powerful laser light, high power alignment laser just assures high security dot alignment constantly.